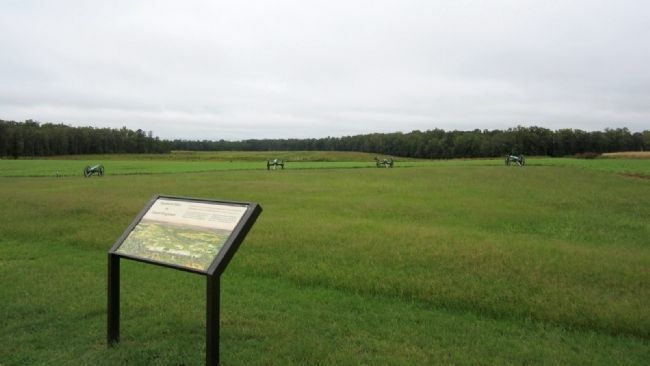 As dusk approached on July 1, massed Confederate infantry made one last grand advance. Victory or defeat in the last battle of the Seven Days awaited its outcome. Dozens of Federal cannon opened fire, blasting huge gaps in the Southern ranks. Thousands fought and fell within yards of one another. But for Lee’s troops, courage alone was not enough. The Federal gunners, supported by advancing infantry, held firm. McClellan’s army had survived. Park. Marker is at or near this postal address: 9175 Willis Church Road, Henrico VA 23231, United States of America. Touch for directions. Other nearby markers. At least 8 other markers are within walking distance of this marker. Malvern Hill (here, next to this marker); a different marker also named Malvern Hill (a few steps from this marker); A Splendid Field of Battle (within shouting distance of this marker); Battlefield of Malvern Hill (within shouting distance of this marker); Union Firepower (within shouting distance of this marker); Battlefield Landscape (within shouting distance of this marker); Seven Days Battles (about 300 feet away, measured in a direct line); The West House (about 300 feet away). More. 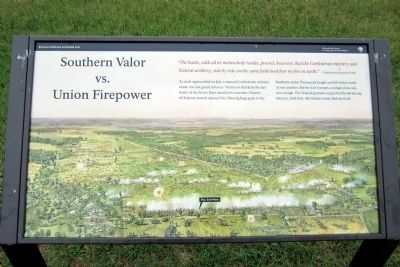 Search the internet for Southern Valor vs. Union Firepower. Credits. This page was last revised on June 16, 2016. This page originally submitted on September 7, 2011, by Bernard Fisher of Mechanicsville, Virginia. This page has been viewed 422 times since then and 5 times this year. Photos: 1, 2. submitted on September 7, 2011, by Bernard Fisher of Mechanicsville, Virginia.